Researchers at the University of Texas at Dallas have reported a new type of artificial muscle that’s both impressively powerful, and surprisingly simple. It’s basically just twisted and coiled polymer fibers — off-the-shelf fishing line or sewing thread will do. Upon application of heat, the coils shorten up to 49% of their original length, lifting many times their own weight. 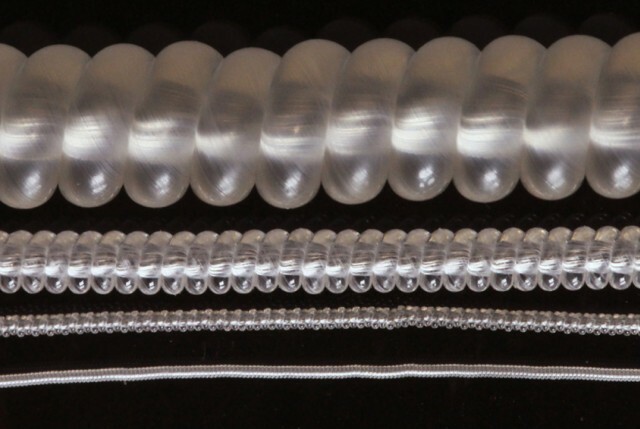 In fact the artificial muscles are over 100 times stronger than human muscle of the same length and weight. The new polymer coils have a number of advantages over other heat-activated artificial muscles, such as nitinol muscle wire. The most obvious advantage is a much greater stroke length (the distance the fiber can contract); commercial nitinol wires contract about 4%, but the polymer coils show contactions ranging from 16% to 49%. Moreover, while there is always an inherent trade-off between stroke length and load, simple changes in the coiling procedure allow this trade-off to be easily tuned to suit the application. Finally, while nitinol has a very abrupt change in length from “long” to “short” at its transition temperature, these coils have a nearly linear change in length over a fairly wide range (until the coils are actually stacked together, of course). This was the direct coiling technique, where the twist itself causes the fiber to collapse into coils. Another procedure is to wrap twisted fibers around a cylinder, and then cook them a bit to stabilize the structure. This results in a polymer spring the same diameter as the cylinder, and by varying the ratio of this diameter to the fiber thickness, a wide variety of muscle properties can be obtained. Of course like all thermally-activated muscles, these things are neither quick nor efficient. In fact the best efficiency the researchers measured was 1.32%, compared to about 20% efficiency for human muscle. Their speed depends on how quickly you can heat the fibers up, and cool them back down. Best results are obtained by bathing the fibers in a fluid, which is much better at carrying heat away than air. This QuickTime movie shows a 2-ply nylon muscle, coated with silver so it could be heated electrically, in a cool water bath. Under these conditions, the muscle was able to lift a 100 g load by 10% of the fiber length, five times per second. Find more information at Science, IEEE Spectrum, Medical Xpress, and GizMag. And, for more context, check out our previous coverage of another approach taken by some of the same researchers. « Is Wolfram Language the New ROS?